Thrixopelma cyaneolum Schmidt, Friebolin & Friebolin, 2005, also known as “Cobalt red rump”, is a stunning medium-sized bird spider due to its coloration from Peru. Because some German taxonomists are of the opinion that the name Thrixopelma cyaneum initially used is not available, it is later in 2005 being replaced by the new name Thrixopelma cyaneolum sp.n. The rather dull colors at early age become more vibrant while growing up, showing an overall marineblue shiney coloration with deep red abdominal setae. Sad but true those colors fade away as time passes since the last molt. With the exception of the bright blue femura, other leg segments do show some beautiful lining, similar to the far more famous Aphonopelma seemanni. Beginning hobbyists often confuse those 2 spiders, but there is a little trick. Thrixopelma cyaneolum shows a reflective patch of urticating setae on the abdomen, which is different to the neutral abdomen of Aphonopelma seemanni. ATTENTION: This caresheet is very different to almost every other caresheet on the web. In our opinion, Thrixopelma cyaneolum is kept far too hot and humid. Common name: Cobalt red rump. Formerly known as: Hommeoma sp. ex Peru, Grammostola sp. ex Peru, Hommeoma sp. blue/small. 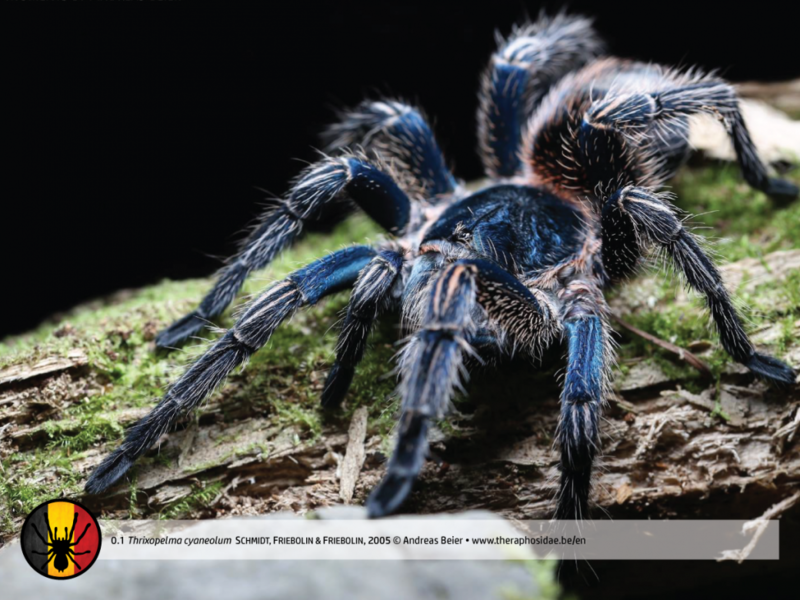 Previous names: Thrixopelma cyaneum Schmidt, Friebolin & Friebolin, 2005a, Thrixopelma cyaneolum Schmidt, Friebolin & Friebolin, 2005a, Thrixopelma cyaneum Peters, 2005b. Origin: Central-West Peru (from Huancavelica until Huancayo and Huánuco). Body length: ≤ 5cm. Female Thrixopelma cyaneolum become larger and heavier than males. Adult males become up to 3,5cm and possess tibial hooks.  Behavior: Compared to Thrixopelma ockerti, Thrixopelma cyaneolum is far more docile. The spider will flee at first. Persistent provocation can result in use of urticating setae, although that’s rather the exception. Thrixopelma cyaneolum shows her beauty quiet a lot in captivity. Don’t be surprised if the spider refuses food for a few months. Life expectancy: Due to the fact the spider is a very slow growing species (and the female becomes adult at an age of 6 or older) it is being assumed females can bewome up to 20 years old. This, however, is not being confirmed yet. Males are given a shorter lifetime, becoming adult at 3-4 years. Thrixopelma cyaneolum lives a few tens of kilometers inland from the Peruvian West coast (source). Remarkably, the locations as given in the paper exhibits very different climate, being overall rather cold and dry for the avarage bird spider. Local temperatures fluctuate between “rather cold” and “cold”, making Thrixopelma cyaneolum a very hardened species. Please do not provide extremes in captivity, as it is not ideal for the spider. Temperature: 20-23°C (day), 16-19°C (night). Adult: LxWxH: 25x25x25. Min. 3x span width in surface. Smaller than adult: 0,75x span width. * Keep substrate slightly moist. * Provide a water dish. Rather dry from april until november. Avarage temperatures around 9°C. Never below freezing point. Rather dry from april until november. Avarage temperatures around 12°C. Never below freezing point. Rather dry from april until october. Avarage temperatures around 20-22°C. Never below freezing point. Differences in scopula, distinguishing Thrixopelma spp. • Scopula of metatarsus III extends over 2/3 of the segment. • Scopula of metatarsus III extends over 1/3 of the segment. • Scopula of metatarsus III extends over 1/2 of the segment. Pairing Thrixopelma cyaneolum normally runs smoothly. In general a pairing don’t need any special introduction. • Make sure you’re pairing the spiders in very calm area. Too much vibrations might cause a breeding failure. • Keep temperature after mating fairly constant, around 18°C. Raise up temperature after 3 month to 23-24°C, while raising up humidity around 70%. • The female will start making the cocoon 3 months after mating. Gestations sometimes takes 1 year. Deprive the cocoon, when desired, 4 weeks later. Store the eggs at a humidity of 70% and a temperature of 24-26°C. Numbers may vary from 100-200 spiderlings. • Thrixopelma cyaneolum has been sold as Hommeoma sp. blue/small? Thrixopelma lagunas, in that time, was known as Hommeoma sp. blue/large (and Euathlus pulcherrimaklassi).